It is has been chilly and rainy here for about a week now. I am in the middle of making my son a felted Irish hat - wanted a break from that so I whipped out another scarf pattern. This one is for myself, I love the look and the feel of it. I used 250-253 yds of Plymouth "Sweet Caroline" which is 100% cotton. It is very soft and drapey, just the way I like my scarves. On the next one I make I may try a yarn where the color is changing like Knitpicks Chroma, I think that would look nifty with the diagonals. Photos are at the bottom as well as the pattern if you'd like to download. 3.5 sts per inch in Garter St. NOTE: these 3 rows will only be worked once. Now skip to row 4 below, work rows 4 – 16 of the Pattern Rows below. NOTE this will only be done once. 1. K2tog, yo, *k3, k2tog, yo; rep from * to last 5 sts, k5. 2. P2, *k3, p2; rep from * to end. 3. K4, k2tog, yo, *k3, k2tog, yo; rep from * to last st, k1. 6. K2, *p2, k3; rep from * to end. 7. K2, *k2tog, yo, k3; rep from * to end. 8. *K3, p2; rep from * to last 2 sts, k2. 17. Work pattern rows 1-10. 177 sts. Click on the link below, you should be able to download or print from there by clicking on "File". If this does not work for you you may try switching from Firefox to Internet Explorer or vice versa. Worst case senario you can copy and paste the directions into a word doc and print it out. Enjoy! I just love this? Thank you for the pattern! Stunning! I look forward to casting on after the holidays -- the "me time" knitting season! Thank you for sharing. It looks so pretty and cushy. I WANT to try making this, but it won't expand when I click and I can't copy & paste. how can I get the pattern? Sue Hunt - hmm, I've never even heard of not being able to copy and paste - I would say that there must be something seriously wrong with your computer - something to have looked at. The pattern is in the body of the post of course so you can see it to work from. You could also try opening it on another computer. I have a few folks tell me that it wouldn't open on their laptop but was fine on their pc or vice versa - probably settings or something. grazie mille... è veramente bello e ben spiegato. lo voglio fare e subito. Very pretty! A question about the pattern, though. After the first for setup rows, shouldn't you follow rows 1 - 16, not 4 - 16? Thanks. No, Stick with the directions, they are correct. After competing rows 4 - 16, you will THEN go back and work rows 1 - 16 repeatedly. I see that now, Kris. Thanks! It's coming along nicely. I'm doing it in a variegated red/burgundy/black worsted wool. Ithanks so much for your lovely free patterns. 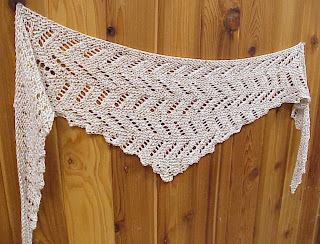 Can this be done on straight needles? Sandy Pink - yes, it could be done on straight needles, just make sure they are longer ones to accomadate the large number of stitches. Have fun! Debs69, I like a 29". 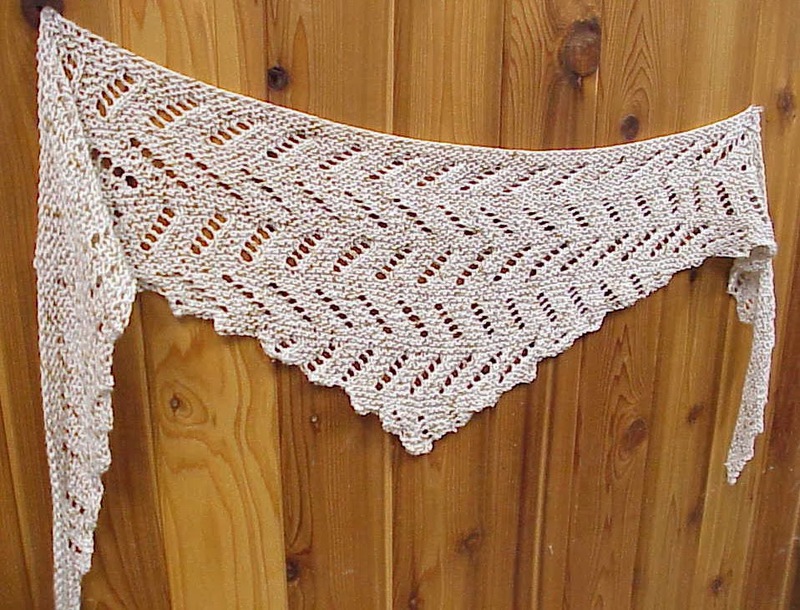 Thank you so much for this pattern, it will be next on my needles. 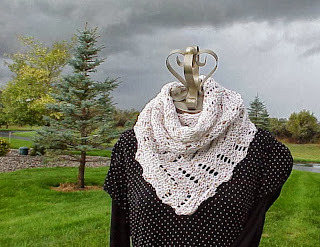 If doing this on circular needles are you connecting it so it comes out as an infinity type scarf, your one picture looks as if it is flat....is your preference circular needles just because of the number of stitches? Yes exactly, it is not a circular scarf (not joined), it is worked flat. I use circular needle simply to accommodate the large number of stitches. You can absolutely use straight needles if that is your preference. Just make sure they are long ones. What size needles should I use if knitting on straight needles? Momma Moose: you use the same size. Just make sure you use straight needles that are plenty long to accommodate the large number of stitches. What is row 16? It just says to repeat 1 thru 15, but i need a purl row of some sort. Elaine Maier: 16 is just to tell you to "Repeat rows 1-15 of the pattern rows 4X more. then you should have 157 sts. There is no need to purl a row. Kris, just finished the 4 repeats of 1-15, running low on yarn. Going to work rows 1-3, then forward to row 18 and finish.mdumb question: how does the scarf stay in place and fluffed as in photo? Do you tie it? This is for a friend and I don't wear scarves. Just want to be sure it is long/wide enough to tie or whatever. Annonymous: I actually tie mine to wear it that way. You can wear it several diff. 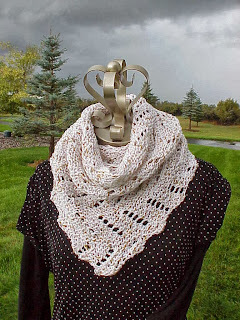 ways I suppose but I like this particular scarve tied cowl style. Just my preference. Made this and just love it. Thank you for sharing this pattern. Is there a similar pattern in crochet?? Love it! I made this beautiful shawl in a dark red wool yarn....my friend loved soo much than i gave it to her and i am doing another one for miself. I think I saw this on Facebook last week and cast on! I am having a hard time putting this down; it's so fun to knit. Thank you for sharing your design! I just finished this in a dark green, wool blend Tonic. It sure saved my sanity on the long, international flight. So glad I found your pattern on Ravelry. I have some cotton silk that's being re-purposed for this scarf. Thank you! I happened upon your site and I love your patterns! Thank you! Will definitely being knitting a couple! I love the look and feel of this scarf. I knitted it up in no time and used Simply Soft yarn. It turned out beautiful and soft. Everyone at work loved it. This scarf is beautiful and I want to try and make it. However, I am a beginner knitter, I knit (Eastern) European style, and English is not my mother tongue. It took some time to figure out what k2tog means, but I got it, tog is for together. I would be grateful if you could explain what I am supposed to do with: Kfb = knit in front and back of st to increase. Does this mean that I insert the right needle in the loop on the left needle, yarn over and pull up a loop, but keep the original loop (into which I had previously insterted the right needle)on the left needle and then pull another loop behind the left needle and only then cast off the original loop? I am not sure if you can follow my train of thoughts... But thank you anyway for the beautiful pattern! Thank you soo much for your kind reply! I did not imagine I could find that on You tube. I am definitely going to make this scarf! I am doing this pattern with a thick/thin alpaca wool blend in red. It changes the look dramatically - very nice! I have just finished my scarf in Debbie Bliss Baby Cashmerino and it looks fabulous and feels wonderful to wear. Thank you so much for this pattern. Thank you very much, it is so beautiful! Am I doing something wrong? After doing the set up rows and rows 4 thru 15, I am starting row 1 on the "wrong" side, considering row 1 is the "right" side. Or, is there no real right or wrong side and I should keep going??? After you have worked the set up rows, then work 4-15, your stitches will be angled one direction, which for the moment is your right side. When you the go on to work rows 1-15 as directed in step 16, every time you do this (work rows 1-15) you are changing direction and thus you have a new "right side". YES! That is helpful. Thank you. I just finished downlowading and making my own checklist. I started making the scarf using Cascade 220 in a mauvy/pink heather. It won't be as drapy, but will be warm come next winter. I like what someone else did - using Caron Simply Soft. Never thought of that. It is soft and light. Will try that next. Has anyone tried to use a sock weight yarn? I was to use a smaller needle, maybe a 5? How does this change the overall look of the scarf? I know this is unorthodox but I'm making for a friend who picked out the yarn, and the pattern and I'm trying to accommodate her choices. P2, *k3, p2 What does the asterix signify at this point? Normally in a knitting pattern the "*" means that to finish the row out you repeat whatever follows the astricks. In this particular row (row 2) I didn't need the astrix because this will complete the 7 stitches that you need. But you will see in upcoming rows that the astrix is used - again this means to repeat whatever comes after or between astrix until otherwise directed. I haven't seen anyone else ask this question, so I guess I must be 'thick'! I've just finished the Gallatin Scarf, piece of cake, love it. (Thank you for sharing). Made it with a thicker yarn and 8mm needle and turned out great. So thought I'd give this one a go, I got stuck on the set up row!...... I've cast on my 7 sts, Knitted 2 together, yarn over and knitted 5, that gives me 11 stitches. So, P2, k3,p2 still leaves me with 4 stitches at the end of Row 2! I guess I'm not understanding the 1st row...... So frustrating! : ( Can you help please. k2tog (leaves 1 st), yo (makes one st), then knit 5. now you still have 7 sts. So I am not sure how you ended up with 11 sts. Next row, which is row 2 of the setup rows, you P2, K3, p2. This is still 7 sts. Are you sure you're looking at the setup rows and not jumped ahead to the pattern rows? You work the setup rows first, then it instrucs to go to row 4 of the pattern rows. Hi Kris, Thanks for that, I see what I was doing wrong now. I kept the yarn over for each of the knit 5, that's why I ended up with 11 stitches! Apart from that 'senior moment', I find your patterns very easy to understand. Thank you. Jen. Just saw your Definitely Diagonal pattern in the new Mary Maxim catalog. I made this pattern last Spring. It is beautiful. Thank you tor sharing your patterns with us. Love your work! I will try to knit it , if I have a question can you please respond. Thank you God bless. I have knitted 2 of your lovely Definitely Diagonal scarfs. Easy pattern to follow. I have received many compliments on them. Thanks for your lovely work! Thanks so much! Just what I was looking for! I an having trouble knitting this,, I did the set up rows, then 4-15 rows. Row 16 says start row 1 again. It makes the diagonal on the opposite side? Yes, this is correct it should make the diagonal go the other direction. Thanks for this pattern, Kris. I made it with Lion Brand Scarfie and it worked up fairly well - nice and cozy. I'm using it more as a shawlette. When I make this the next time, I think I'll use something where the wonderful diagonals show up a little better, as in your example.